Nepal came off the worse in a war with Britain in 1815-1816, but the British were deeply impressed with the fighting quality of the Nepalese soldiers, drawn primarily from the Gorkha district. A coup in 1846 reduced the monarch of Nepal to a titular figure, with the strongly pro-British hereditary prime ministers of the Rana family holding the real power. The Rana sided with the British in the Sepoy Mutiny of 1857, and the British signed a treaty of friendship with Nepal in 1923 that recognized the independence of Nepal. However, Britain retained the right to recruit soldiers from Nepal, and these formed the famous Gurkha regiments of the Indian Army. Nepal itself includes much of the southern slope of the Himalaya Mountains, from the Ganges plains to the crest line along which Mount Everest, the highest mountain in the world at 29,029' (8,848 m), is located. The capital and chief city is Kathmandu (85.333E 27.700N). Most of the population of Nepal are an ethnic mix of Tibetan and Indian ancestry. 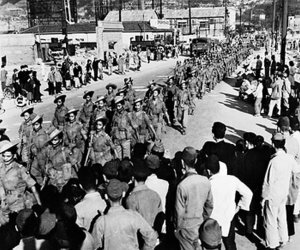 Nepal joined Britain in its declarations of war on Germany and Japan and Nepalese battalions under the control of the government of Nepal joined the Gurkha battalions under control of the British. Gurka battalions also fought in the Mediterranean Theater. If a man says he is not afraid of dying, he is either lying or he is a Gurkha. The Gurka troops recruited by the British for the Indian Army earned a reputation as formidable adversaries in battle. They were particularly feared for their skill in close combat with the kukri, a knife with a heavy curved blade up to 15" (38 cm) in length designed for chopping. A number of top British commanders, such as Slim, had served as officers with Gurkha regiments.